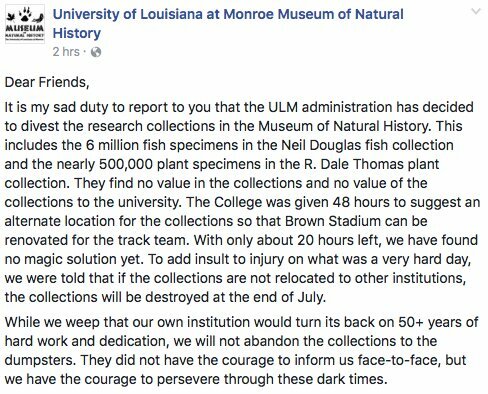 This plant specimen at the University of Louisiana in Monroe—and some 500,000 others—are looking for a new home. The post was viewed 100,000 times, shared 1200 times, and generated more than 400 comments—as well as national headlines—before it was taken down at the request of university administrators. But with the attention, the darkness lifted. “Dozens and dozens” of other museums and academic institutions had offered to take in the collection’s 3 million to 6 million preserved fish, and some 500,000 plant specimens, says Thomas Sasek, a biology professor who also serves as the botany curator of the university’s natural history museum. As a result, “there’s no longer a danger of destruction,” he says, although the decision about exactly where to send the museum’s collection is still being finalized. It’s not the first time the museum, part of a small campus that serves about 10,000 students, has faced difficulties. Two biology professors—Neil Douglas and Dale Thomas—founded the collection decades ago. Douglas started collecting fish with his students in 1962, and Thomas added plants. After Douglas and Thomas retired, those who took over—including Sasek—had big shoes to fill. Shrinking university budgets complicated matters, often leaving curators shorthanded. The events that led to the collection’s recent near-death experience began in 2012, when the fish and plants were in storage, awaiting the renovation of a museum space. After a fire damaged a different academic building, administrators moved the collection to make way for classrooms. The specimens ended up in the university’s stadium, which has temperature controlled rooms and a sprinkler system. (The fish are stored in highly flammable alcohol.) But when the stadium was scheduled to get a makeover in August, the collection faced eviction. Since 2009, Sasek has been able to win nearly $600,000 from the National Science Foundation to make digital pictures and other information about his plant specimens available to the public over the internet. Now, the collection’s impending move could complicate that project, which is part of a regional collaboration with other institutions. There is 18 months of work left to do, he says.